It's undeniably winter these days: snow and wind and definitely too cold to be anywhere outside of your bed. Oh, I guess we can make an exception for the theatre. Hopefully things will warm up a few degrees for FIRST NIGHT - it's not too early to get your button. In the fight for diversity, equity, and inclusion, creating platforms that give voice to the nuanced experience of all parents will identify how the theatre culture at large can act to make better pathways back in for those left out of the discussion, thus directly affecting the pipeline, content, and population of our craft. The Parent Artist Advocacy League for the Performing Arts (PAAL) is a national resource hub and all-parent, all-discipline league advocating for a national standard of best practices for parents in the performing arts. This HowlRound series builds on the work of PAAL and will cover challenges faced by parent artists and offer some solutions and advice.—Rachel Spencer Hewitt, series curator. What happens when you take an entire ARTS festival & jam it into one amazing show with performers of all kinds who create upon the theme of COMMUNION? 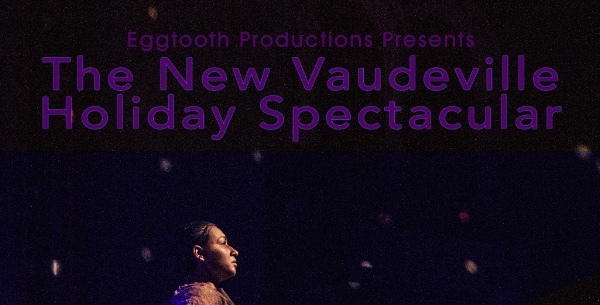 A crazy wonderful New Vaudeville Holiday Spectacular! Tickets at https://www.brownpapertickets.com/event/3180581 are $15 with all children under 15 FREE. Hosted by Joe Dulude II with Katherine Adler, movement artist. 1. Excerpts from Savage -- a new musical in development. Savage is based on the true story of Wanda Savage, a Native American sharpshooter who rose out of Oklahoma poverty to perform in circuses and vaudeville before taking on Hollywood as a stunt woman and actress in silent films. With Nicolette Blount (Producer, Writer, Composer), John Waynelovich (Musical Director, Composer, Arranger) and Lindel Hart (Writer, Editor). 2. The Ballet Belles: Myah Grant and Madalyn Lilly, perform three excerpts from La Boutique Fantasque – the Overture, Tarantella, and Waltz – using the Rossini-Respighi score. The two young dancers take on the role of dolls who come to life when the shop is closed. The Ballet Belles are directed, and work choreographed, by Karen Shulda, Artistic Director Ballet Renverse, ret. 3. Emma Ayres, The Water Project Folk Opera is Emma Ayres' reimagining of her original play: The Water Project. Set in a rural Western-Mass dreamscape of the Great Depression, the story illuminates the archetypal conflict of big business interest and political corruption versus the working-class poor. In the Swift River Valley during the year 1938, a clock struck midnight, ringing in disincorporation, heartbreak and loss of place, all in the name of progress. "Newspaper headlines read: 4 towns flooded, 2,500 people relocated, houses moved on the backs of trucks, 7,500 graves dug up and reburied on higher ground, memories drowned, and little know..." the water is rising. 4. Alex DeMelo: The Concluding speech of The Great Dictator with Violet Walker on the saw. 5. Ellen Villani: Stand Up Comedy. "So I gave up Holy Communion for Lent about 18 years ago and it stuck!!!! I figured none of us in truly worthy anyway. In place of that I've BECOME communion. I'm communing all over the place. I've got full blown relationships with grocery clerks, gas station attendants, and anyone elderly! 6. Jack Golden: premiere of movement performance, 13 Ways Of Looking At A Black Dog. Just back from a successful run at the Charm City Fringe Festival in Baltimore, Jack received this review:"a very personal performance piece, reflecting on Golden’s life and relationships through words, music and movement. It’s refreshing to see a work based on the real life of the performer that refuses to shy away from the vulnerability attendant to such an endeavor. Rather than covering any discomfort with sarcasm, cynicism, or any of the other shields we use when we feel exposed, Golden goes with the truth. He admits the unscripted, improvisational component of the show scares him; he owns his feelings about family and loss. The result is a refreshingly honest, unironic look at the life of a kind man who has spent the last few decades touring the country, educating kids, making folks smile, and getting to know Jack better." 7. Jeremy Geragotelis: John Berryman Reads My Poems, Feat. A Bottle of Whiskey is a close character study that mythologizes the suicide of renowned poet of the 20th-century John Berryman. This piece of theater considers the boundary between the artist's practice and the ghosts of historic influence: how can we make our artistic context dangerous and forward-reaching? 9. Phoebe Lloyd and Michayla Robertson Pine, who brought the immersive work The Cityto the Full Disclosure Festival last month, offer an original devised theater piece with music called The Blue Room. 10. 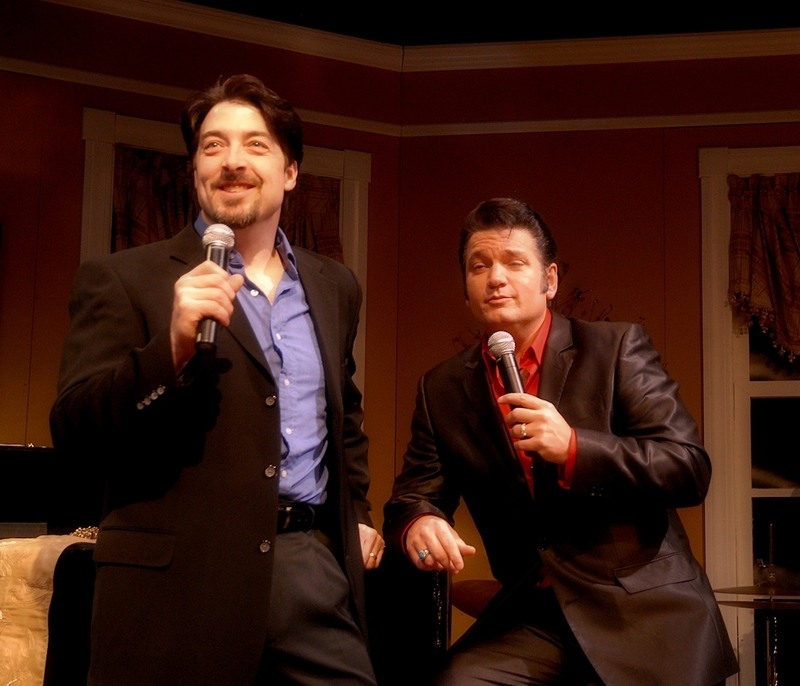 John Lentz - Vocal Jazz and Bass. John Lentz sings jazz stories. He is accompanied by Michael Suter on double bass. 11. Violet Walker clown extraordinaire plays the saw! 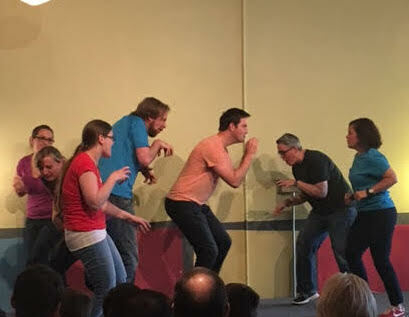 Monthly family-friendly improv comedy show, best for 5-12 year olds and their adults. Saturday, December 16 at 3-4pm at The Eric Carle Museum of Picture Book Art (125 W Bay Rd., Amherst). Tickets at the door: $10/Adults, $5/Kids, Free/4 yrs and under (Reduced admission for museum members). For more info. The Northampton Arts Council is delighted to present our city’s 33rd annual New Year's Eve festival of the performing arts on December 31, 2017. 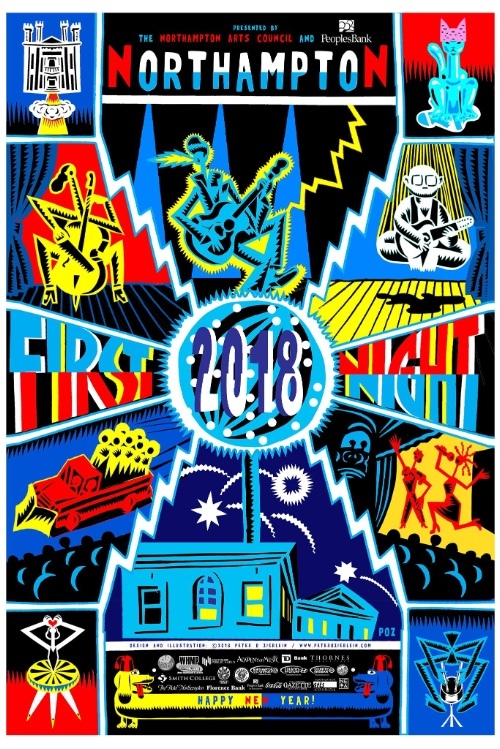 This is the first year that the Northampton Arts Council will produce First Night. Arts Council staff are working closely with the Center for the Arts to ensure a smooth transition and to preserve the community’s New Year’s Eve tradition. First Night Northampton continues to be a special opportunity to celebrate the cultural vibrancy of our community while sharing time with friends, neighbors and visitors. Because the event falls on a Sunday this year, it’s poised to be the centerpiece of a long holiday weekend, drawing enthusiastic crowds to the venues and streets of downtown Northampton. A First Night button—available at various locations throughout the Pioneer Valley and online—is your ticket to each performance at every venue, day and night. The Northampton Arts Council and their partners at PeoplesBank invite you to take part in this alcohol-free, family-friendly event. All are welcome. First Night depends upon the support of our most important partner: the city of Northampton. The offices of the Mayor and Central Services along with police, fire, public works, and licensing departments are critical to its success. We also rely on the generosity of performance venues throughout the city and button-sales locations throughout the Valley. In the end, we benefit from the assistance of over 100 volunteers, who make a logistically complex operation run smoothly. Hampshire Shakespeare Company is currently seeking 2 Directors and a Fundraising Director for the 2018 Summer season of “Shakespeare Under the Stars,” which will include the adult productions of Othello and Twelfth Night and the Young Company production to follow. Please see the website for more information on how to apply!